We are officially OPEN in Peachtree City! The first 50 people to buy a 6-Pack of Cinnabons will get FREE Cinnabon for a year and the first 50 people to buy a Schlotzsky’s combo meal will get FREE Schlotzsky’s for a year! Come see us at 2771 W. Highway 54! This restaurant chain used its signature round sandwiches to inspire an updated interior design while leveraging a custom-made equipment package to rejuvenate operations. Like many in middle age — people and restaurants alike — Schlotzsky’s had become frumpy. The Austin, Texas-based sandwich chain, which turned 40 this year, still had a popular signature toasted sandwich to tout, but just about everything else about the concept had become tired, inconsistent and borderline irrelevant in today’s competitive fast-casual arena. With growth stalled and unit closures on the horizon, some serious “nipping and tucking” was necessary. That process applied to the chain’s contemporary new look, as well. Teaming up with Atlanta-based Back Lot Productions, a brand development and design firm, Schlotzsky’s spent about two years doing consumer research to understand the brand’s strengths (its food) and weaknesses (tired look and feel, inconsistency, spotty geographical coverage) and what its customers wanted. Designs were drawn up and put before consumer panels. The best impact, however, was on revenues. Sales at the new prototype, which opened in the fall of 2009, were 40 percent higher than in the old unit that it replaced. Roddy and company were now armed with solid confirmation that they were on the right track. All new stores have the new look, and the company is in the process of reimaging or doing full remodels on all existing Schlotzsky’s units nationwide; the company intends to complete all basic reimaging by the end of 2011. Roddy says that new-store success has been strong, but he’s even more excited about the results being achieved by remodeled units — an average 28 percent increase in sales. To that end, order and drink counters are now rounded. Tables are round, patterns on the tables are round, and lampshades are round with round patterns on them. 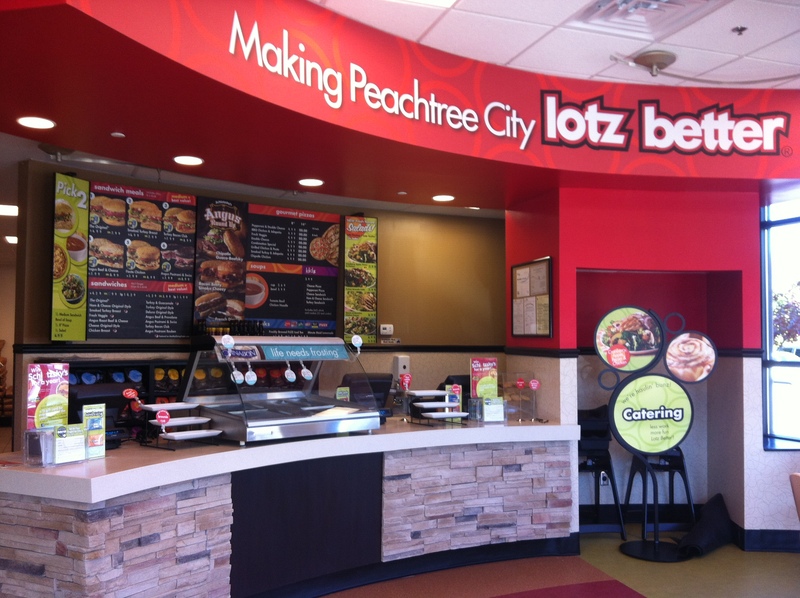 The shape is used as a design element in all merchandising materials and signage, on the company’s website, in its packaging and new logo, which features the brand promise “Every Bite Lotz Better” inside a circle with the “o” in Schlotzsky’s highlighted in bright red to draw attention to the shape. Colorful circles are even painted on building exteriors to carry the theme. While the company kept its heritage color scheme of red and green, it introduced more contemporary shades of those colors and ditched its original Italian flag and wheat sheaves imagery. Higher-quality furniture, including soft seating, was added as part of the company’s commitment to offering a dining experience that’s “Lotz Better” than what customers would find at competitive restaurants. Another major change at Schlotzsky’s since its acquisition by FOCUS Brands is the introduction of co-branding. All new units going forward as well as many existing units will feature not only the Schlotzsky’s regular menu, but also Cinnabon and Carvel branded products. Those concepts, also owned by FOCUS Brands, are seen as complementary to rather than competitive with Schlotzsky’s and so far have proven profitable additions to the mix, according to Roddy. With Schlotzsky’s own dessert menu already in place —cookies, cheesecake and carrot cake — company officials had some concerns that the new sweet additions might cannibalize sales. They didn’t. Rather, the addition of Cinnabon and Carvel sparked average check increases from about $7 for a standard sandwich-chips-and-drink order to $9.85 on average including the additional branded products. Overall, the move led to an increase in total sales of what Roddy calls the treat category from the previous 1.5 percent to 2 percent of sales to an average of 10 percent to 12 percent. To date, Cinnabon drives most of the incremental volume. He adds that this year the company is opening up a Cinnabon inside of an existing Schlotzsky’s at the rate of one every four days. Existing franchisees also have the option to purchase Carvel licenses. All new Schlotzsky’s units going forward, however, will incorporate both Cinnabon and Carvel brands. Although Schlotzsky’s added value and a service element with table runners, the company also keeps the “fast” part of fast casual as an operational mandate. In particular, drive-thru service times must be three minutes or less. Equipment made to spec, with an emphasis on speed, enables that to happen. The company has partnered with key manufacturers for its ovens, in particular, and requires its franchise partners to install specified brands only. “We’re looking at speed. The sandwich has to get to a certain temperature in a certain amount of time. There are only so many pieces of equipment that will work for us. Our vendors worked with our chef to get the specs just right, and we hold very tightly to those specs to ensure product consistency,” Roddy says. Schlotzsky’s ovens include proofers and bakers for its signature round sourdough bread, as well as belted cheese-melting ovens that toast the sandwiches. Employees use a two-sided prep line, with one side used for preparing in-restaurant orders and the other side for drive-thru orders. At the start of the line, an employee assembles meats and cheeses from a refrigerated table onto the customer’s choice of bread and places it onto the melting oven’s conveyor belt. As the warm sandwich comes out the other end, another employee finishes it with the appropriate cold toppings and garnishes from another refrigerated table. Other key pieces of equipment include slicers, refrigerated tables for salad prep, and other general prep tables, as well as refrigerators and freezers. Roddy says the company’s new prototype brought no significant changes to the size, layout or flow of the back of the house. It also won’t impact overall unit opening costs. In terms of equipment, Roddy notes that the company has taken out as much as it has added in most areas, so no big changes have been made. One exception, however, is ventilation hoods. Since Schlotzsky’s changed several years ago from gas ovens to electric, ventilation hoods are no longer required in most units, unless they’re required by a specific municipality. With its new prototype being rolled out systemwide, co-branding paying off and franchise activity heating up, Schlotzsky’s is poised for significant growth in the years ahead. The company’s goal is to nearly double to 600 units by 2015. It intends to get there by leaving another aspect of the old Schlotzsky’s behind: its approach to franchising. Namely, it is turning away from its legacy model of one- or two-unit, hands-on owner-operators. In addition to reimaging or remodeling all existing stores, the company expects to have 20 new stores open before the end of this year. Another 40 to 50 are in the pipeline for 2012, and even more momentum is building for 2013. While most of these new stores will be franchised, the company plans to add corporate stores at a rate of 10 percent to 15 percent of the franchise system’s growth. Architect: The Roberts Group, Lexington, Ky.
Design: Back Lot Productions, Atlanta, Ga.